The Washington Utilities and Transportation Commission (UTC) filed a formal complaint on Tuesday against the Seattle touring company that owns and operates the vehicle which crashed into a charter bus and killed five people last week. The UTC filed the complaint Tuesday evening, just one day after the state agency indefinitely suspended all operations for Ride The Ducks of Seattle as a result of the fatal crash. Perhaps the most significant portion of the claim is the part that alleges the vehicle involved in the crash was operated and maintained in “an unsafe manner.” The claim details that the vehicle involved in the collision did not have a specific axle repair that had been recommended for such types of vehicles by Ride The Ducks International, which is based in Atlanta, Georgia. 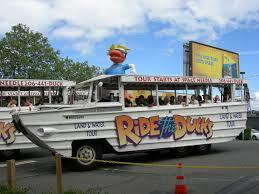 “Atlanta-based Ride the Ducks International refurbished the 1945 Army surplus vehicle involved in the crash and sold it to Ride the Ducks of Seattle, an independently owned licensee, in 2005. It said in a written statement Monday that it warned its customers in 2013 about potential failure of the front axle housing assembly on 57 vehicles in service around the country, and it recommended specific inspections and repairs to reinforce the housing. UTC officials say they will not be able to determine the exact cause of the crash until their investigation is completed. Witnesses have stated that the front-left wheel appeared to lock up right before the vehicle unexpectedly began swerving and crashed into the charter bus, which was carrying a group of international students. The UTC website details the minimum insurance requirements for various types of commercial vehicles in the state of Washington. The UTC explains that the minimum insurance requirements for commercial passenger vehicles carrying 16 or more passengers is $5 million. The DUKW vehicles can carry up to 30 passengers, so it’s presumable that they would require the $5 million minimum insurance. While it is good for accident victims to know that there should be a minimum of $5 million in insurance coverage available, the fact that there are so many potential claimants may complicate the case. There were five fatalities from the collision, as well as dozens more injuries. If you or a loved one has been seriously injured as a result of the Ride The Ducks crash, it may be in your best interests to consult with a personal injury lawyer about your legal options. If you wish to meet with us, we’ll help you better understand your legal rights and make sure you understand the best options for you and your loved ones.